I was recently invited back to Bear Nibbles to paint more murals in their head office! This time I was told not to hold back and the brief included painting an entire meeting room as if you were up in the canopy of a cherry tree in full blossom. 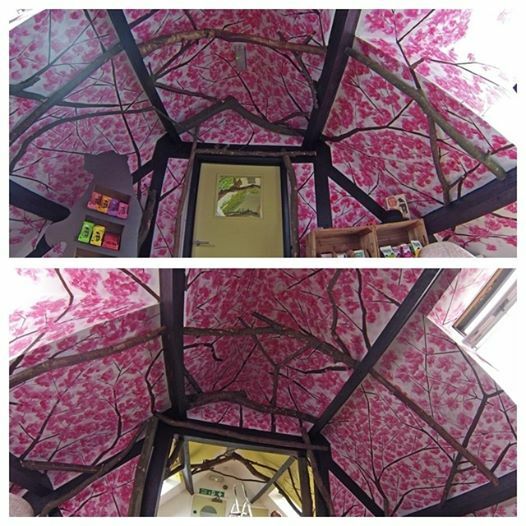 I also expanded my work in "The Cave" painting more of the ceiling as a canopy to compliment the wooden sculputures and tree trunks that had been freshly installed. There will be a timelapse video soon but for now you can check out a video of the work I did for them last year painting their stairwell as an entrance to "The Woods"
and the cherry blossom ceiling below!